Here is my first portrait attempt! I used charcoal on Strathmore charcoal paper that I toned with charcoal dust before I started. This is a six hour session done in 50 minute or so chunks of time spread out over a week or two. The subject is my handsome husband. I haven't done a full scale charcoal drawing in a while and I found I was a bit out of practice. To my eye, it shows. There are plenty of mistakes but, for a first attempt, I am pleased. Life drawing today wasn't so great. I have come to the realization that it might not be the best use for my time and money due to the nature of life drawing with a diverse group of people who all have different needs as to artistic direction. I am going to pull back for a while and rethink the situation. I must add, this decision has nothing to do with the wonderful group of artists who come to life drawing. It has more to do with my own needs and resources. I do miss being part of a group with a common artistic goal. This is a short post this week as I want to get a few more things in place today so I can hit the studio hard next week. For a first portrait I think you have done well! 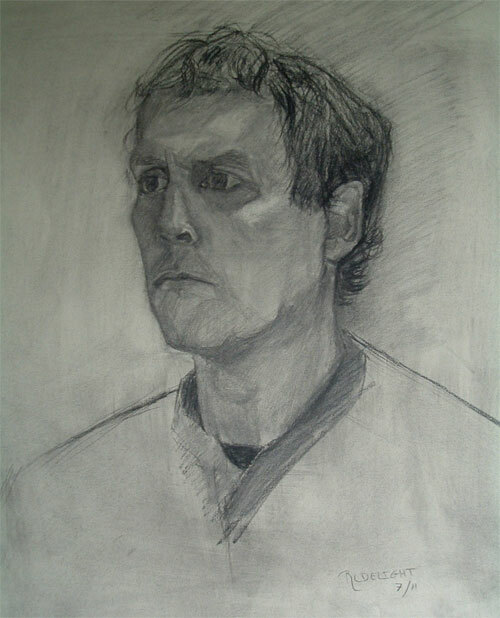 I teach portraiture (among other things) and not many of my students do so well in their first try. Oh very nice! And how nice that you are streamlining to your needs what you want to concentrate on. BTW, Loved the Clara Peeters post. I love the general period and the richness of the paints and details of the subject matter contained in many of the paintings.